Last week I began my food challenge with Empire Chicken, from Jamie’s Great Britain book. It had lots of potential, roast chicken with an Indian marijnade, Bombay potatoes and a curry sauce made from the juice of the chicken. It almost worked, but not quite. The chicken was moist, the Bombay potatoes lovingly spiced but the gravy, for me the bit of the dish I was most looking forward to, just failed to deliver. Almost all of the pint of stock had evaporated and as such I was left to improvise. I ended up with a curried gravy, but not the chicken stock thick sauce I was excited to taste. The whole thing has potential, I’ll have to figure out what went wrong and try again another time. This week we revisit another Jamie Oliver book, this time Ministry of Food. Flicking through on Sunday morning in a somewhat slightly hungover state, I was keen to find something that wouldn’t stretch me too far yet still come under the banner of something I’ve not tried to make before. 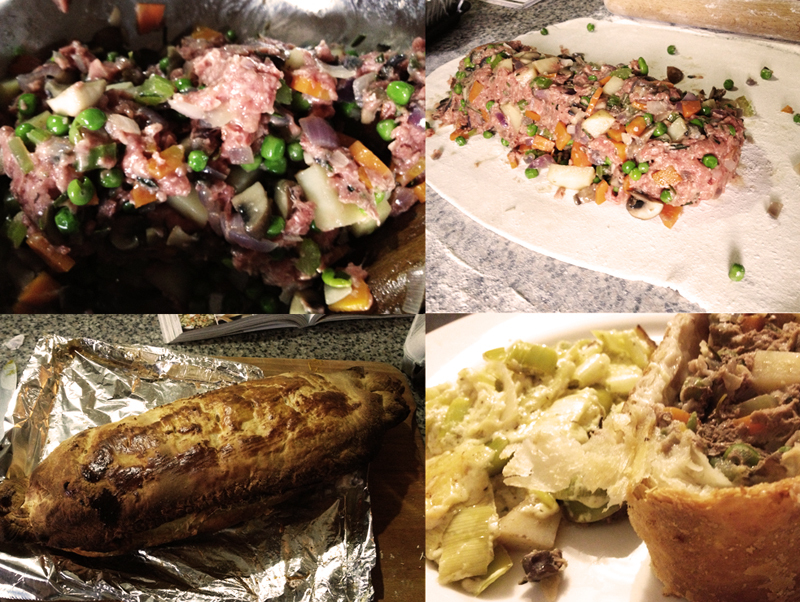 I landed on a page entitled Minced Beef Wellington. Bingo. I’ve been planning on making something like this before and if you’ve not tried to put this together yourself I really think you should give it a whirl. It takes an hour to cook, and roughly half hour prep and makes an interesting change to the usual mince recipes you have, week in week out! With carrots, potato, peas and celery all wrapped up in crisp puff pastry it’s a little bit like biting into a Cornish pasty. Yum! The book recommend serving with greens or mash potato, but instead I decided to put together some creamed leeks which complimented the star of the show perfectly. As a bonus there is plenty leftover for tomorrow’s lunch. Huzzah!